Last October, you may have seen a “fact” from your email/Facebook/Twitter friends (you know the ones) that the month would have five weekends–five Fridays, five Saturdays, and five Sundays–and that that happens only once every 823 years. Now the “fact” is showing up again since the same thing will happen in July 2011. But just think about it for a second–this will happen any time a month with 31 days starts on a Friday. The Gregorian calendar we use today runs a much shorter cycle than 823 years. The closest we can get to its cycle being measurable in centuries is the leap year cycle, which is 400 years. This is reflected in the frequency of leap years, which occur in a year that is divisible by four, unless it is divisible by 100 (no leap), unless it is also divisible by 400 (leap). And while it might feel like every year is different, there are really only fourteen possible calendars. (To think, you’ve been buying a new one every year!) 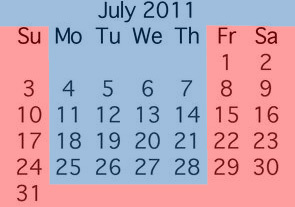 January 1 can be any of seven days of the week (which also determines the days of the rest of the dates). And it can either be or not be a leap year. Seven days times two possible numbers of days is only fourteen ways to have the dates and days matched up. You can also take this opportunity to teach your tweeting kids not to be the people who spread interesting but wrong tidbits. Critical thinking and real facts are more fun than fakes ones every time. Liked it? Take a second to support Ruth Suehle on Patreon! ← Happy 200th Anniversary, Sense and Sensibility! You’ll certainly notice that you get paid a bit more on 5 Friday months. If you pay your mortgage on a weekly basis, you’ll end up ahead an entire month at the end of the year (hopefully, you never end up on the wrong side of a weekly rent). Non-leap years repeat with a spacing of 11 – 11 – 6 years. So 2011 = 2022 = 2033 = 2039. Thanks for this – I”ve added it to my facebook. Seriously, very tired of smart friends posting this STUPID fact.